While its origins are still slightly mysterious, many scholars believe this painting to represent Saint Ivo of Kermartin. Also known as Yvo or Ives, St. Ivo was born in north-west France to a fairly wealthy family in 1253. When he was just fourteen years old, Ivo was sent to study civil law at the University of Paris, which was already about a century old when the future saint matriculated. He eventually went to Orleans to study Canon law, the law of the Catholic Church. While serving his various appointments, such as ecclesiastical judge of Rennes, Ivo continued to study biblical scripture and was eventually ordained and appointed to priesthood, first in the parish of Tredrez and later in Louannec, where he died of natural causes in 1303. 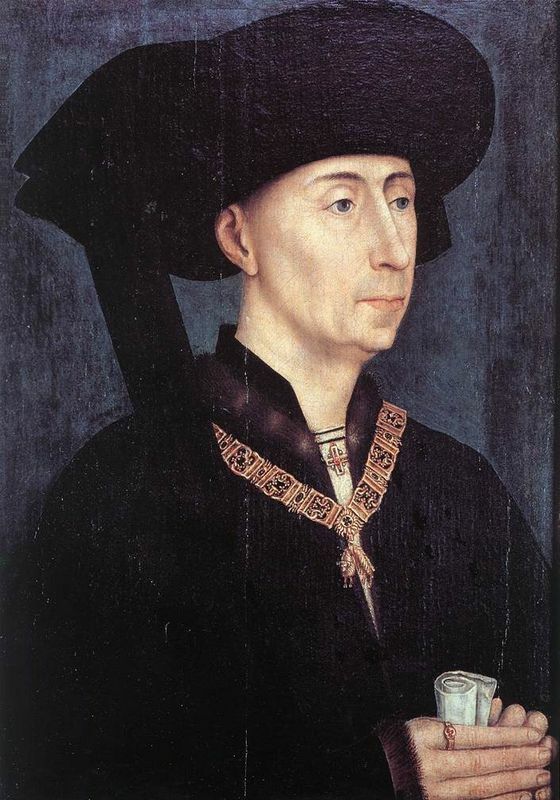 During his time as a priest, Ivo worked zealously and tirelessly to fight unjust taxation from the French crown and opened a charity for the poor, which earned him the reputation and title of the Advocate of the Poor. He was canonized by Pope Clement VI in 1347 thanks to urging by the Duke of Burgundy, Philip I and the testimonies of a number of his parishioners, who praised his boundless goodness and his ability to replace the sin of the land with pure holiness. St. Ivo's feast day is May 19, the same day he died, and he is the patron saint of the Brittany region of France, lawyers and abandoned children. His tombstone in Treguier reads "Saint Ivo was Breton, a lawyer and not a thief, a marvelous thing to the people." 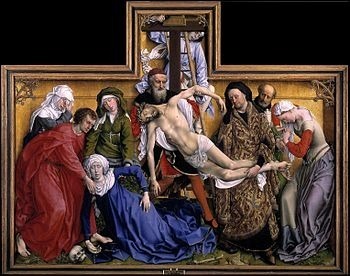 Since the origin of this work, like so many of Rogier van der Weyden's works, is shrouded in mystery, not much is known about what inspired the artist to move forward with this idea. It is believed that this particular image was at one time part of a larger painting, possibly the left-hand side of small devotional diptych. It is most likely that this painting was commissioned by a wealthy person or institution and that that person or group had some kind of connection to St. Ivo. This painting is comprised of a single subject bent over some kind of document. It is believed that this was a legal document, which would fit well with the knowledge that St. Ivo, prior to his ascendancy to holiness, was a trained lawyer and judge. Interestingly, St. Ivo's face is not the center of the painting, but is positioned to the right of the panel, allowing the viewer a crystal-clear glimpse of pastoral fields and a lake, with what appears to be either a cathedral or a castle in the distance. 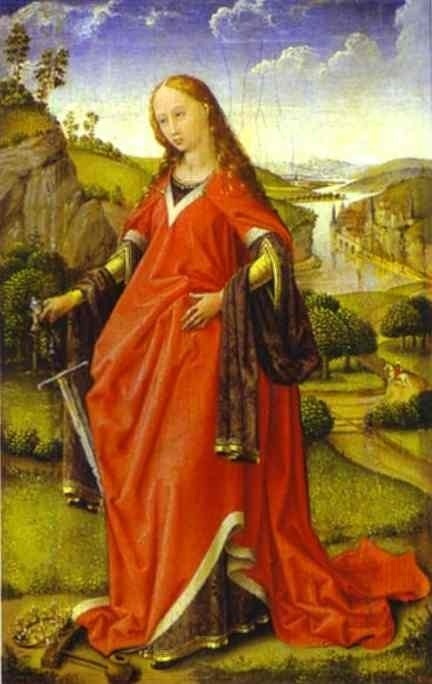 The askance position of the saint's body indicates that this painting has not always stood alone, and is perhaps a left wing of a larger work. Van der Weyden chose to use dark, rather non-descript colors for St. Ivo's clothing and accommodations. He reserved the lighter and brighter colors for the document he is studying and the inviting outdoor scene. While Rogier van der Weyden is often credited with being able to elicit emotion through his subjects faces better than his contemporaries, this painting does not seem to quite live up to that reputation. However, it can be argued, of course, that nobody reading a legal document would exhibit much emotion. 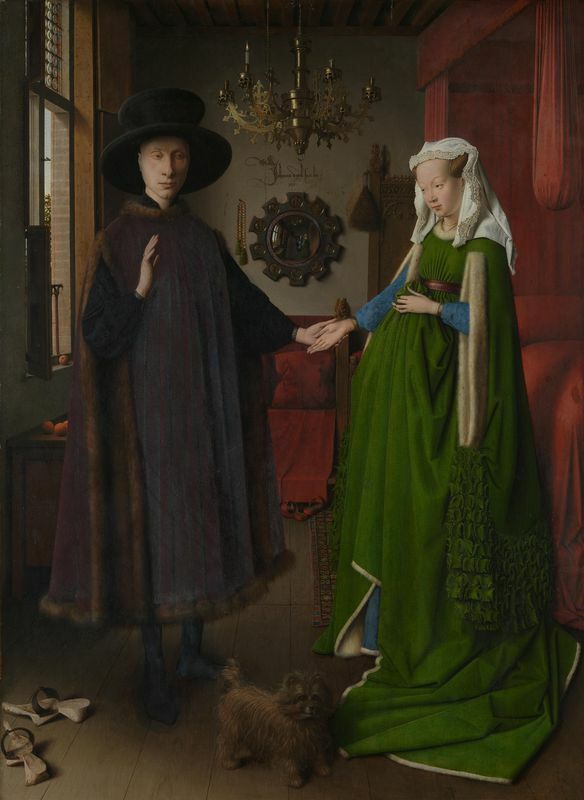 Even so, this painting does not contain the same emotive quality as so many of van der Weyden's works, perhaps so as not to draw attention away from a lost central panel in a triptych.